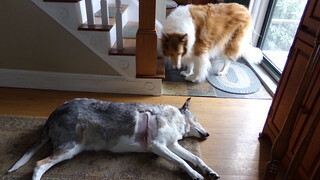 Em had her surgery yesterday. 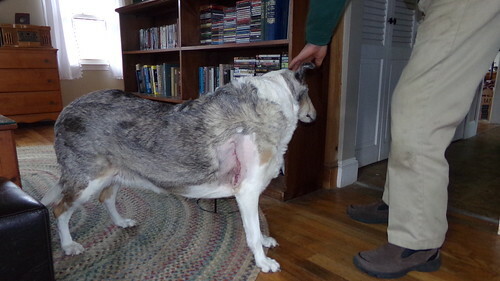 She had a “fatty mass/tumor” at the top of her right arm/shoulder area that was getting larger slightly, so the doc recommended removal of it. That was yesterday. But I have to say that Kip was pretty good yesterday. Once the initial shock of Em and Paul leaving the house without him wore off, he kept me company pretty quietly… a good boy he was. Oh, poor baby! That looks like a really nasty incision. I hope it heals real quickly, so Em can get back to being her sweet self! Sending everyone hugs. It’s always hard when someone in the family is hurting. Glad that’s done with. Mend quickly, all of you! Nasty wound. Get well soon, Em. Poor Em. She is so lucky though to have her buddy and her Mom & Dad. 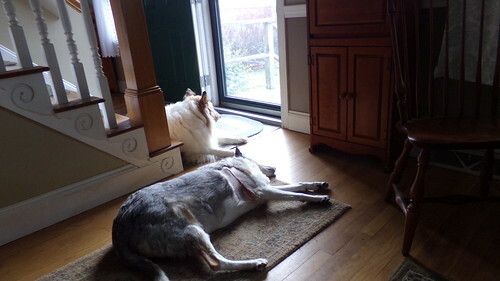 My White/Tri-Factored rescue collie, Maia, had to have a huge lump off under her arm and she has been great ever since. Doc said they can grow back but one year in she has no more. All the best to Miss Em! I am concerned about Buddy if anything happens to Buster. He will yell constantly when Buster is out of sight. Buster is the older bird I think. Best wishes to Em for speedy healing and a boring path report. Glad to hear Em came through the surgery OK! Wishing her a speedy recovery!